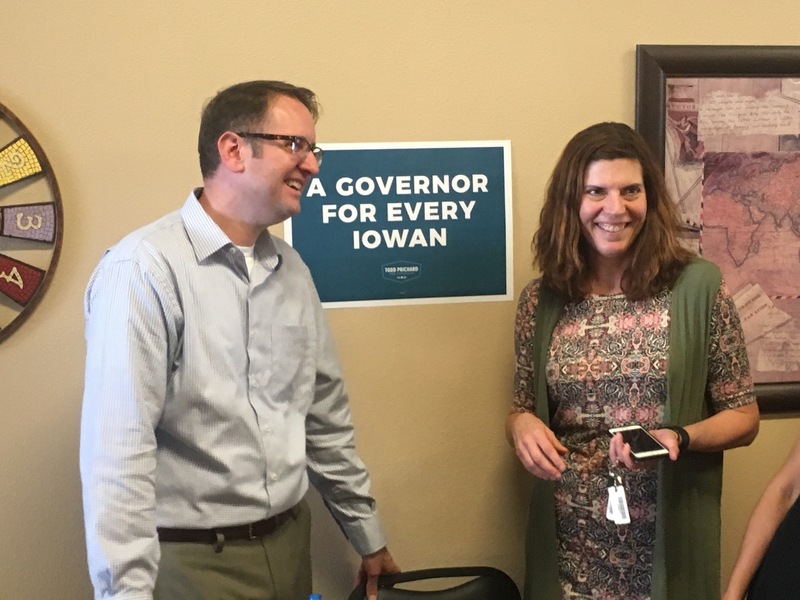 CHARLES CITY — Promising to be a governor for all Iowans, Rep. Todd Prichard, D-Charles City, launched his bid for Iowa governor Tuesday morning at Aromas coffee shop. A crowd fills Aromas in downtown Charles City on Tuesday to hear Rep. Todd Prichard announce his gubernatorial candidacy. It was standing room only at Aromas in downtown Charles City as Prichard, 42, made his announcement. After the event, he left with his team and family to begin a series of campaign stops across the state. Click here for a list of campaign events. Prichard and his wife, Ann, a public school teacher, have three children. They will accompany him to some campaign event, but not all, Ann Prichard said. Democratic gubernatorial candidate Todd Prichard is interviewed Tuesday at Aromas in Charles City by KIMT-TV. Todd Prichard has served in the active Army, Iowa Army National Guard and is currently in the Army Reserve. He has been deployed overseas four times including as a company commander in Iraq. He is a three-term state representative, has a law office in Charles City, and has served as a prosecutor, defender and litigator for more than 10 years. This entry was posted in Charles City and tagged Army, Army Reserve, Iowa governor, Iraq, National Guard, Todd Prichard. Bookmark the permalink.